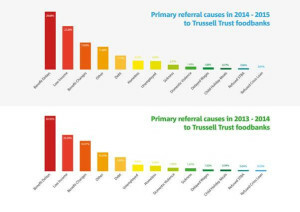 The Trussell Trust, the UK’s biggest foodbank charity, has released figures today showing that foodbank use is at an all time high. Last year more than a million people used Trussell Trust foodbanks to receive three days’ worth of emergency food, including 400,000 children. This figure is up from 900,000 last year. The charity says that problems with benefits remain the biggest driver of foodbank use, but that the past year has seen a two per cent increase in the number of ‘low income’ referrals. Foodbank managers report that clients who are in work are struggling with the combination of insecure work, low wages and high living costs. Meanwhile, the number of clients driven by benefit delays and changes has proportionally decreased from 48 per cent to 44 per cent over the past year . 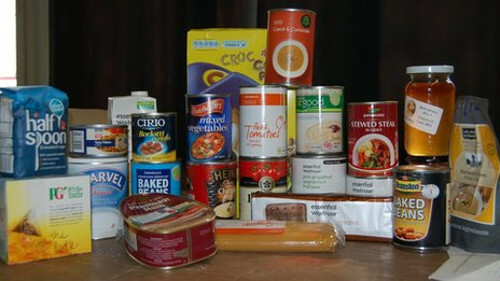 Referrals to foodbanks due to sickness, homelessness, delayed wages and unemployment have increased slightly. Curtis added that most foodbanks were now hosting additional services to help people get out of long term economic crisis, such as debt counselling and welfare advice. The figures show that last year there was a five per cent increase in the total numbers of food banks launched, while the number of people helped by foodbanks rose by 19 per cent. 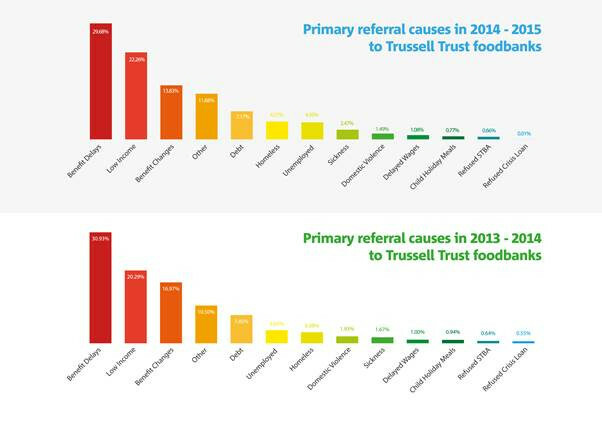 There are the most foodbank users in the North West of England, followed by Scotland. Northern Ireland has the lowest number of foodbank users, followed by the East Midlands. The Faculty of Public Health said today that it supported the Trussell Trust’s call to listen to the experiences of people using foodbanks, in order to gain an insight into how best to end food poverty in the UK. Its a free lunch !!! There are no free lunches JoeDM. Nation 100 per cent taxpayers from the 75 per cent of tax coming from stealth indirect taxes and VAT, we all pay, in or out of work, and however long we live. But then foodbanks are charities, with little or no state funding. You JoeDM prefer to pay subsidy to private companies burning still edible food by 400,000 tonnes of lost surplus food to the foodbanks. UK’s foodbanks are not the 7 day a week free cafes available in European countries, funded by EU money that the UK denied foodbanks here, paying without vouchers, the working poor, poor pensioners far more than just the unemployed, every day of the week. People are starving to death or fearing such a fate, commit suicide. Neither Tory, Labour nor Lib Dems offer any hope to the starving. Foodbanks use was rising under Labour back in 2006. Sanctions will become permanent under Universal Credit, even to those in work as UC will absorb working tax credits. even if worked all their lives, nearly half a century. That is the truth of the flat rate state pension. Nil Pension Credit even to the over 75s. Attendance Allowance and disability benefit taxed at source, even if kept from all losses coming more and more. Universal Credit denies Pension Credit payout if either of a couple is below the raised retirement age. Carer’s Allowance lost to 40 per cent of current claimants, as will only be eligible to those entitled to Universal Credit. And so much more from the austerity-obsessed Tory, Labour and Lib Dems. 15 million weeks of sanctions. We are in the realms of politicians ignoring starvaton, as they did in the Irish Potato Famine. The English did come to the aid of the Irish. 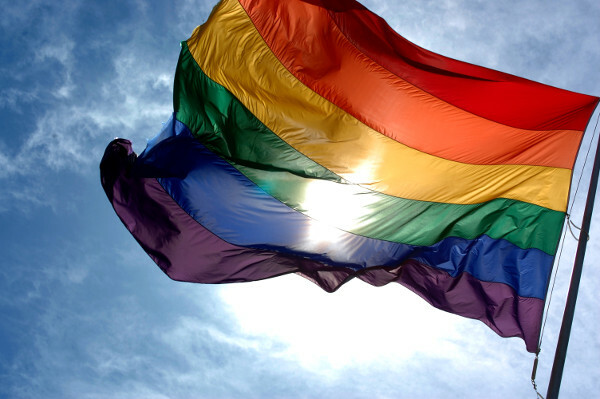 The world did. It is time the world realised that our politicians are Marie Antoinette’s They have no bread, Well… Let them eat cake. It’s criminal that people have to use foodbanks at all, and you are claiming that, because it wasn’t 1 million unique users, it’s all lies? Was there a million vouchers collected? Yes, ergo foodbanks were used 1 million times. QED. So is that 1m people using the foodbank once? Or one person using it a million times? Or more likely – around 333,000 people using it three times? I don’t deny there’s a problem, but an honest approach to the facts would help. 15% had multiple visits. You are in complete denial of the problem and facts. No, they did not admit anything of the sort. Their statistics were mis-reprisented. You then link the blog of a serial liar. And it’s typical of the right that they quibble over and distort the statistics, rather than admit there is a problem. It doesn’t convince anyone, though they no doubt think they’re being clever with their childish tactics.